Follow the Leader is a dynamic game and also very interesting. It plays in the shape of a circle and can be adapted to the existing conditions. 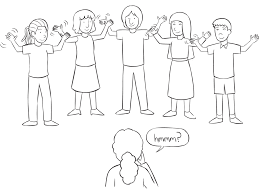 In the game, the person in the center tries to identify who’s the originator of the activities, and people attempt to imitate one leader’s activities. Follow the Leader is an action game that acts as warmup action or a good energizer. There is no preparation. Find a large open space, either inside and outdoors. Ages 8 and up. Recommended. Of People: One group of 8 to 16 individuals. Step 1: All participants in this game must make a circle and listen to the rules. The organizer ensures that those present are ready to play. Ask an individual to leave the room for a moment. This person will act as a riddle for the round. The group decides who should be the leader while he or she left. ‍Step 2: Invite the person who left for a little while, and is arranged in the center of the circle. When the round begins, everyone starts to beat their arms down and up. The leader will begin to make other movements without being too obvious to discover that the leader is, and everyone reproduces the activities of the leaders. Step 3: The leader can do exactly what he wants. Everyone in the circle should be careful to avoid visual contact so that the individuality of the leader is not denied. The one inside the circle has to turn his head to try to figure out which individual is the leader. The one in the circle who intuits who the leader is allowed to make up to 3 assumptions. Step 4: If the person inside the circle assumed who is the leader, they are exchanging seats. The one who was the leader is coming out for a while because that someone else has to be chosen. It plays so until many have the opportunity to be leaders. In the game, Follow The Leader, it’s important to be ready to assume the role of a leader, but also to watch carefully if you are in the center. If you are in the position of the leader who coordinates, then do the gestures when the person in the center does not look at you. But if you are at the center of the circle, follow carefully who will be the first to change the rhythm or movements. Participants have the opportunity to learn new things about them.